Six years before he played dour Roger Collins on Dark Shadows, Louis Edmonds happily dashed about a Greenwich Village stage in a pink bow tie, singing and dancing as Algernon in a hit off-Broadway musical adaptation of Oscar Wilde's The Importance of Being Earnest called Ernest in Love. Ernest in Love opened to glowing reviews May 4, 1960, at the Gramercy Arts Theatre in Manhattan. Ticket sales were so brisk that it moved to the larger Cherry Lane June 14. The musical's plot remained faithful to Wilde's intricate original story. In 1890s England, two aristocratic young men use fake names to escape social obligations, which eventually lands them in hot water. Jack (John Irving) claims to have an irresponsible brother named Ernest, who is making trouble in London. This allows him to repeatedly slip away from his palatial country estate (and from his ward Cecily, played by Gerrianne Raphael). Posing as Ernest, Jack courts the lovely Gwendolyn (Leila Martin). Jack confesses his charade to his chum Algy, who in turn admits that he uses an imaginary sick friend called Mr. Bunbury to get out of dining with his aunt, Lady Bracknell (Sara Seegar), who happens to be Gwendolyn's mother. In a lively tune called Mr Bunbury, Algy sings, "It's wise to have a nom de plume, so when you're done you can't be chased and can't be traced for what you may have done to whom! Bunburying's a lark, especially after dark!" The New York Herald Tribune's Judith Crist wrote, "Lost is a delicate ballad, and all of the musical trimmings are pleasant and made all the more so by their delivery." She called Louis a strong-voiced Algernon who had a good time with his lines. When Algy and Jack are caught in their duplicity, they commiserate, then argue, over a plate of muffins. Jack cries out, "I don't know how you can eat at at time like this," and Algy responds musically, "You can like or lump it, but a bit of crumpet and a spot of tea will free your tensions..." in The Muffin Song. Of course there's a happy ending, and the cast assembles to sing Finale (Ernest in Love). 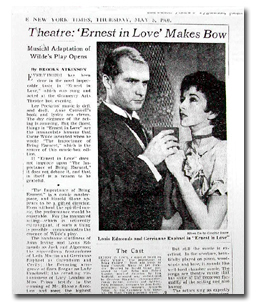 Brooks Atkinson of The New York Times showered the production with praise: "Everything has been done in the most impeccable taste in Ernest in Love," he wrote in his May 5 review (which featured a photo of Louis and cast mate Gerrianne Raphael). "Lee Pockriss' music is deft and droll. Anne Croswell's book and lyrics are clever. The dry elegance of the acting is amusing.... The handsome stiffness of John Irving and Louis Edmonds...testifies to the cunning of [Harold] Stone's direction, and meets the highest standards of off-Broadway performing." Atkinson would have been just as happy to see a non-musical performance, however he wrote, "The actors sing as expertly as they play the characters, and the whole performance radiates sly good nature. Although the musical embellishments of Ernest in Love do not improve on Wilde, they do not betray him." The Village Voice called Louis "an exquisite, impeccable Algernon." Womens Wear Daily said, "John Irving and Louis Edmonds are first rate as the gay blades involved in this merry charade." 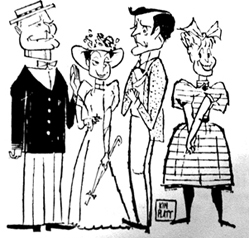 Caricatures of four Ernest cast members, including Louis, appeared in the May 11, 1960, issue of The Village Voice. Some reviewers weren't as fond of the play. Variety called it a "pallid musical with undistinguished acting." However, the reviewer wrote, "when there's a song to be sung, the cast shines." Jim O'Connor in the New York Journal American called the acting "quite good," but found the plot "as dated as an old-fashioned tintype." O'Connor singled out Lost as the "best song in the show." The show closed after 111 performances. a musical based on Oscar Wilde's "The Importance of Being Earnest." Book and lyrics by Anne Croswell. Music by Lee Pockriss. Cast album was released as part of the Columbia Masterworks series. 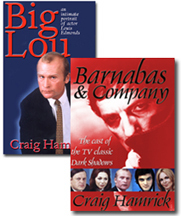 Read more features about the cast of Dark Shadows. Musical Heaven's synopsis of the show.